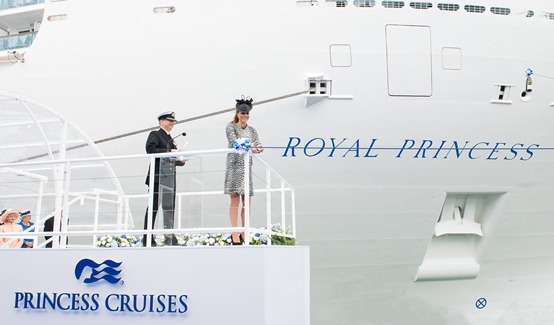 In a spectacular ceremony today in Southampton, Her Royal Highness The Duchess of Cambridge named the new ship Royal Princess when she released a bottle of champagne that smashed against its hull. Standing on the naming platform with the ship’s Captain Tony Draper, The Duchess pronounced, “I name this ship Royal Princess. May God bless her and all who sail in her.” She then cut the rope that sent a giant Nebuchadnezzar-size bottle of Moët & Chandon champagne toward the ship, officially welcoming Royal Princess into the fleet of Princess Cruises, one of the world’s largest international cruise lines. “We can think of no more fitting godmother for our magnificent new Royal Princess,” said Alan Buckelew, Princess Cruises’ president and CEO. “Her Royal Highness is an inspiring ambassador for Britain – with whom Princess Cruises shares strong ties – and she is admired around the world for her style and grace. We’re so honored she accepted our invitation to become godmother to our new ship.” The ceremony included star-studded entertainment that blended maritime tradition with contemporary elements, reflecting the innovative spirit of Princess’s newest class of ship. In addition to the exciting bottle break moment, the quayside festivities included a host of musical performances, including British pop singer Natasha Bedingfield singing her hit “Unwritten,” as well as an original song by British actress and “the first lady of London’s West End,” Kerry Ellis. Internationally renowned percussive orchestra Mass Ensemble performed with its signature “Earth Harp,” an architectural instrument with strings that extended 1,000 feet and was played as it hovered over the nearly 2,000 ceremony guests. The Band of Her Majesty’s Royal Marines Portsmouth and The Pipe Band of 1st Battalion Irish Guards opened the event with the pomp and ceremony of British ship-naming traditions. The Right Reverend Tim Dakin, Bishop of Winchester, conducted the traditional ship’s blessing. The event capped off a week of festivities to launch the ship, including a special gala last night. 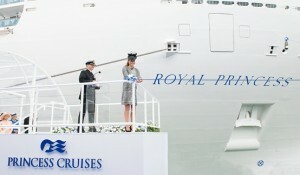 Among the guests invited to the Royal Princess naming celebrations were representatives from the charities East Anglia’s Children’s Hospices, SkillForce and WellChild, whose Patrons are The Duchess of Cambridge, The Duke of Cambridge and Prince Harry respectively.The naming of a ship is a tradition thousands of years old. Different peoples and cultures have shaped the ceremonies surrounding a ship launching but the theme has always been similar – the ritual marks the birth of a vessel, and asks for a blessing of good fortune and safety for the ship and its passengers and crew. Perhaps the most important element of the naming tradition is the godmother selected to christen a ship. In the mid-19th century it became customary for a woman of distinction to be selected for this honor. A godmother is the symbolic patron, or sponsor, of the ship through its entire life and symbolizes the spirit of the vessel. Princess Cruises has a history of illustrious godmothers for past ships, including Diana Princess of Wales (who named the first Royal Princess in 1984), Audrey Hepburn, Sophia Loren, Dame Margaret Thatcher and Olivia de Havilland. The Duchess of Cambridge now takes her place among this inspiring group of women. 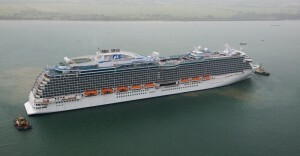 The 3,600-passenger Royal Princess is a new-generation ship. Among the special features found on board is a dramatic multi-story atrium serving as the social hub of the ship offering a host of dining and entertainment options; an over-water SeaWalk, a top-deck glass-bottomed walkway extending 28 feet beyond the edge of the ship; plush private poolside cabanas that appear to be floating on water; the new Princess Live! television studio; the largest pastry shop at sea; a special Chef’s Table Lumiere, a private dining experience that surrounds diners in a curtain of light; and balconies on all outside staterooms. Following the ship’s maiden voyage to Barcelona on June 16, Royal Princess will sail on Grand Mediterranean cruises throughout the summer, followed by Eastern Caribbean cruises beginning in the autumn.